The tour begins with a 30 minute training session. You'll glide from the peninsula through Museum Campus to the Shedd Aquarium and the Field Museum. Then you'll cruise along Lakeshore Drive at the edge of Lake Michigan all the way to Millennium Park at the foot of famous Michigan Avenue. You'll see Navy Pier, the Lincoln statue, Buckingham Fountain and of course, ride the coolest machine in the world the entire time! As you cruise along Lake Michigan, through Grant Park and the Museum Campus, you will receive a great orientation, informative historical and current-day information, heaps of unique and fascinating stories, fantastic photo ops and superb personal service from your guide. The Segway is the first of its kind - a self-balancing, personal transportation device that's designed to operate in any pedestrian environment. It's new, it's cool and a ton of fun! Tours are limited to 8 clients with 1 guide so you can count on a great, intimate experience. Discover what it's like to be a Windy City celebrity as everyone turns to watch you glide by! 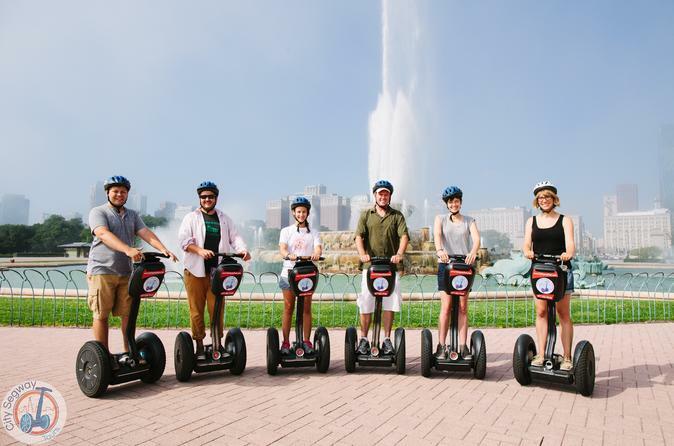 City Segway Tours are proud to be the first guided tour using Segways in the world! No one can match their experience. Be sure you glide with the original!